In 1936 “Miss Florence” Griswold was in danger of losing her house. Over the years starting with the arrival of Henry Ward Ranger as a boarder in 1899, it had emerged as the center of America’s most famous Impressionist art colony. The 1817 Georgian-style mansion, with its wide front hallway lined with paintings, its convivial front parlor, its dining room panels decorated with artists’ works, its quaint bedrooms extending up into the attic, and its vine-shaded porch for outdoor eating, had fostered the creativity and friendships that nourished the Lyme Art Colony. Miss Florence, of course—hospitable, charming, and supportive—had made it all possible. It was she who had animated her beautiful family home to become the ideal congenial setting for the growth of American Impressionism. But by the 1930’s Miss Florence’s house was no longer as active as it once was. At the age of 86, she still led hundreds of visitors through the house each year. But now, in the midst of the Great Depression, whose devastating effects reached every American community, she found herself in constant debt. Although she lived as simply as possible, the income from her remaining three boarders was not enough to meet the expenses of running her house, including taxes and mortgage interest. She had always been generous, “forgetting” to charge her artist boarders when they were out of funds and extending them credit between sales of paintings, but now she depended upon the generosity of others. 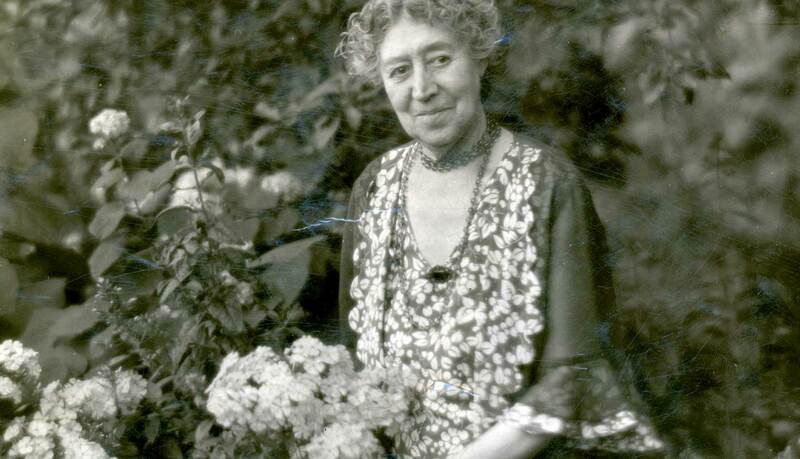 She did what she could—she even sold her garden vegetables for a pittance—but her position was untenable.Miss Florence was the last of her immediate relatives, but she was also a member of the extended Griswold clan, the foremost family in Lyme. Six cousins had begun to contribute to Miss Florence’s upkeep in small amounts on a regular basis, but realizing the inadequacy of their resources, especially since some of them had nearer relatives who were equally hard up, they petitioned the probate court to appoint a conservator who would take control of Miss Florence’s estate on the grounds that she was an “incapable person.” Lucius Horatio Biglow, a lawyer from Deep River whose credentials were as impressive as his name, was chosen for the job. Starting with his appointment on May 20, 1936, Biglow took charge of all moneys received and expended on behalf of Miss Florence and saw that all claims were fully paid. Word must have spread in the village that the credit that sympathetic merchants had extended to a lady in distress might now be redeemed. In the following weeks Biglow paid an overdraft at the bank, an old bill from the Connecticut Light & Power Company, some overdue payments on an Electrolux, returned checks for ice cream and merchandise at Saunders gasoline station, and past-due bills to the laundry, the butcher, and the plumber. Biglow paid the $1,205 owed to Miss Florence’s faithful handyman, James Kent, for back wages, and, most touchingly, the loans he had made to his employer. Biglow also began paying all household expenses and for Miss Florence’s minimal personal needs (a pair of shoes, a visit to the dentist, more ice cream) as they occurred. It was immediately clear to Biglow that Miss Florence’s greatest asset was her house on Lyme Street and its surrounding ten acres leading down to the banks of the Lieutenant River. This would have to be sold to pay off her two mortgages and to provide an adequate income to support her for the remaining years of her life. Accordingly, he placed the entire property on the market and very soon received a large offer (for the times) of $15,000 from an unexpected source—not from the ranks of the ancestrally prominent along Lyme Street but from the socially prominent along Park Avenue in Manhattan. Robert McCurdy Marsh, a law partner in the firm of Delafield, Marsh, and Hope, and a New York State Supreme Court Justice, and his wife, Charlotte Delafield Marsh, wanted to build a country house along the Lieutenant River. Biglow duly informed Dr. Matthew Griswold, who represented the Griswold family. As conservator, Biglow explained, he would be obliged to accept the Marsh offer unless he received an equal or better one. The decision would be made on August 10. This raised the alarming and distressing—in fact, almost unthinkable prospect—of Miss Florence in her final years being evicted from her lifelong family home. In an amazing coming together of relatives, artists, and townspeople, it was decided to attempt what appeared impossible: to raise $15,000 in less than a month—and in the midst of the Great Depression. In some ways, the Depression may have helped the effort. In the Puritanical villages of New England, accepting “charity” was viewed as shameful evidence of a lack of moral strength. But the continuing Depression had touched all lives, the righteous and the unrighteous, the strong and the weak. What happened to one’s neighbor might well happen to oneself. Seemingly disparate groups drew together to help the now vulnerable Miss Florence. In a village known for its secluded serenity—described during that same summer by an art critic at the New York Times as “sweet and untroubled…where art may drowse at rest nor fear the curt rough challenge of reveille”—the speed with which a Florence Griswold Association (FGA) was immediately organized was impressive.On July 16, 1936, the FGA was incorporated in the State of Connecticut. Its purposes were to purchase and maintain the homestead as an example of early New England architecture; to provide a home for Miss Florence for the rest of her life; to operate the corporation on a non-profit basis; to make the corporation and art museum purely educational, historical, and charitable; and to use the real estate exclusively for carrying out the purposes of the corporation. Its proposed officers represented the various constituencies of art, family, and community, who overcame whatever differences they may have had in the past to unite in their common cause. The artist Harry Leslie Hoffman took on the challenging job of treasurer. He had come to Lyme as a young man, boarding at Miss Florence’s and becoming a fast friend. He later married, and he and his photographer wife, Beatrice Pope, settled in Lyme. …First of all I shall pay you what I owe you. Not this minute for I had to pay for my automobile just this morning!…But I expect to be able to forward to you in the near future that amount you have so patiently and kindly waited for. I assure you that I’ll get even with you. I don’t forget favors. Hoffman more than made good on his promise. He not only served as treasurer of the Association during the crisis but continued on for many years afterward. The proposed vice president, Thomas R. Ball, was in real estate, a member of the state legislature, the son of the artist Thomas Watson Ball, and a Griswold cousin. Grace Cramer Clime, the wife of the artist Winfield Scott Clime, would serve as secretary. She and her husband also lived in Lyme, where she had headed the Red Cross drive. Other trustees were Lucien Abrams, an artist; Joseph Bulkley, a lawyer; and Mrs. Charles Ranlet, a Griswold cousin. It was a slate carefully selected for a balance of interests that would serve the Association well. “The Florence Griswold house at Old Lyme is about to be sold under order of her conservator to satisfy the demands of her creditors, and unless funds are forthcoming at once Miss Griswold will be forced to leave her home. Many of her friends feel very strongly that Miss Griswold should be permitted to remain in her house for the rest of her life, and that at her death it should be preserved as a memorial. However, this cannot be accomplished without substantial subscriptions at once, and the pledge of smaller contributions in the future. Printed pledge cards were widely distributed to be filled out and returned “at once” to Harry L. Hoffman, treasurer. The first official meeting of the FGA was on July 20 in the auditorium of the Old Lyme School. The Rev. W. Dixon Hoag, minister of the Old Lyme Congregational Church, spoke first describing the aims of the Association. Dr. Griswold then explained that unless $15,000 could be raised by the Association, the conservator’s plan was to pay off debts and mortgages and to provide for Miss Florence to live either at the Old Lyme Inn or at a nursing home. The “General Appeal” was widely circulated, and the prospect of their revered and dignified Miss Florence being evicted from her home and forced into a hotel across the street was unimaginable to those who heard the news. Eventually the Association would enroll 100 members, who pledged in various categories of commitment, starting with Life Members. “Summer people” joined with year-round residents and with friends who had moved away. Small donations were also welcomed and each was duly recorded. Door-to-door solicitations raised $2.00 from the Colonial Wine Cellars, 50 cents from “a barber,” 25 cents from the Hoxie Store, and 19 cents from an anonymous donor (probably emptying a change purse). A lady who canvassed houses found that people were eager to give what they could and reported “one small boy giving six cents and an old man literally digging one dollar out of his sock.” A neighbor with newspaper connections alerted the New York Herald Tribune to Miss Florence’s plight, and the paper sent a reporter and photographer to cover the story, which was featured on August 8 under the headline “Artists Rallying To Repay ‘Saint’ At Old Lyme.” The Tribune had a wide readership and other newspapers picked up the story so that it that reached former residents and even strangers who were willing to help. Donations came from Louisville, Ky.; Saranac Lake, Fla.; Coral Gables, Fla.; Orange, N.Y.; Worcester, Mass. ; Kennebunk, Me. ; Santa Monica, Calif.; Elkhart, Ind. ; Asheville, N.C.; and Cape Breton, Nova Scotia. Local people donated their services. Annette Burr sent the $5.00 she received for a lecture at Old Lyme’s Boxwood School entitled “Artists and Their Palettes,” Dr. W.L. Smith sent $30.00 from a lecture he delivered at the American Museum of Natural History. A “tenant of Miss Mary Chadwick” offered a benefit concert. Frank Saunders, a housepainter, wrote: Will pledge $10.00 worth of painting per year as long as I am physically able to perform. Hope this will be accepted. If several Painters & Carpenters and Plumbers would do likewise it would help a lot. There will always be rooms to paint Steps Windows and many details that could be done by contributions of work from the various trades in town. Hope you will be able to get them all interested so that we may have a friendly contest of who will do the most. It had been Miss Florence’s wish to leave her house to the artists.But they had agreed that they could not accept it as a home because, as she well knew, it was impossible to make a boardinghouse pay. It was their plan that the house, after Miss Florence’s death, would become a museum. Meanwhile, the artists did what they could. Fifteen of the 100 Association members were artists, some as Life Members. The Association, however, realistically decided to concentrate on raising money before making further plans for a museum. Since the appraisal of the house had not included the paintings in the dining room, Dr. Griswold suggested that the Association meet any offer made for them in order to keep them in the house. Another suggestion was that the artists of the Lyme Art Association who were not represented by panels in the house might paint additional ones to add to the value. Finally it was decided that the panel works had been made as gifts to Miss Florence and should be considered part of the house. No more paintings were added, but when Edward D. Jones of Columbus, Ohio, wrote that “in honor of the charming woman who is the patron saint of Old Lyme,” he would buy for $100 “a picture” by any one of the artists of the Old Lyme group, the painter William S. Robinson offered to donate one of his works. Jones then specified that the picture “should be typical of his interpretation of an aesthetic message—a message to a certain audience in central Ohio.” Robinson’s painting was duly shipped off to Jones.From the first, organizers of the Association had considered selling plots of land to the south and west of the historic house. Dr. Griswold explained to its members that their “only hope of saving Miss Florence’s house for her was in selling off this land.” Once the Association gained title to the entire property, an artist community of homes and studios could be established. A real estate committee was formed and a map drawn up showing ten proposed lots, seven along the river and three further inland. A thirty-foot drive giving access to the lots was designed to wind around the back of the Griswold house and then south to a turnabout. A narrow lane would lead from the drive to a communal wharf. The sculptor Bessie Potter Vonnoh, now a widow, was the first to sign on, choosing three of the most desirable lots along the river. She and her husband, the painter Robert Vonnoh, had lived in Lyme and had long been members of the Lyme Art Association. In her enthusiasm for saving the property, Vonnoh began work on a bas relief medallion, portraying Miss Florence on the front and the façade of her house on the back, as a gift to all subscribers to the FGA. Robinson chose three more lots—two on the river and one directly across the drive. He was a widower and current boarder who had summered with Miss Florence for over thirty years and now, at 76, was planning to be remarried in the fall. Anna Jeannetta Gannett, a patient of Dr. Griswold, chose the river lot between Vonnoh and Robinson. The Christian Science Church was considering buying for its new church the lot adjoining Miss Florence’s and the only other one with access to Lyme Street.Down payments from lot subscribers were made to the Association, but no offers had been made for the two southernmost lots, which were close to Saunders Garage, which Dr. Griswold admitted (despite its ice cream) was “an active, noisy, smelly affair right on the Boston Post Road.” On the eve of Biglow’s deadline, it appeared that the real estate project had stalled. We are so very glad that your gift allows us not to sell it to the Christian Science Church; they put up nice churches, but it does seem as if Congregational Meeting Houses are the most congenial on the main street of a New England village. Amazingly, rescue was at hand. George A. Ball, vice president of the Ball Brothers Company of Muncie, Indiana, telephoned Dr. Griswold’s home on August 9, one day before the Biglow deadline, and offered to send a check for whatever amount was needed to reach the Association’s goal of $15,000. Ball and his wife were interested in preserving historic houses, and when, on vacation in New Hampshire, they read the article in the Herald Tribune, they decided immediately to telephone Old Lyme. After discussing the situation with Dr. Griswold, Ball agreed to contribute $6,700 to the FGA, including his buying the three unsold lots. Ball Brothers was a family business famous for manufacturing the glass jars used in canning to preserve food. This was surely one company whose business had thrived during the Depression when home canning was taken up by a nation of housewives as a thrifty way to reduce grocery bills. For the Association it was a silver lining to the Depression’s cloud.The Christian Science Church could now be notified that the lot it had considered next to Miss Florence’s was off the market. To announce the good news, a special Association meeting was called immediately after the dramatic telephone call. As the meeting was adjourned, jubilant members toasted the Balls in sparkling burgundy. Two days later the Association met again to announce that Judge Marsh had withdrawn his offer. This good news was reported to the New York Times, which quoted Biglow as feeling “certain” that the probate court would accept the Association’s bid within the next few days. Plans could now move ahead for the Florence Griswold Museum with Miss Florence as curator. During the meeting a call was put through to the Balls in Muncie to say that “everything was in order” for taking over the property. It was also announced that Judge Marsh had now offered $4,000 to the Association for the three lots Bessie Vonnoh had selected. But members felt a loyalty to Vonnoh, and no one spoke in favor of Judge Marsh’s offer. The meeting continued onto other items on the agenda, with no one apparently recognizing the growing determination of the Marshes to buy the beautiful stretch along the Lieutenant River on which they had set their hearts. Ten days later, on August 21, another special meeting was called to discuss dismaying news. Judge Marsh had made a new offer to Biglow of $16,000 for the entire property. A fruitless attempt to reach an understanding with Judge Marsh followed. Both sides hardened their positions, with Judge Marsh claiming that he had not been offered a chance to buy any of the lots, and Dr. Griswold stating that at this point the Association was honor bound to the Vonnoh arrangement. Negotiations were resumed, and September 8 was set for deciding on the sale. That morning officers of the Association and Judge and Mrs. Marsh met in the office of the probate judge at Town Hall, along with Biglow, acting as conservator, and two judges who would advise him as needed. Two offers in writing were presented: one from Judge Marsh offering $16,000, the other from the Association offering $15,000 plus occupancy of the house for the remainder of Miss Florence’s life rent-free. Biglow and the two judges then withdrew for about fifteen minutes. Biglow returned to announce that the Association’s offer was the better of the two in its provisions for Miss Florence. Judge Marsh then read a second letter in which he offered to give Miss Florence and a servant the use of her house for five years. Again, Biglow and the judges withdrew for consultation. This time they reported back that Judge Marsh’s offer was accepted. Dr. Griswold then made an offer of $16,500. Judge Marsh countered with $16,600. Opposing bids were then exchanged in increments of $100 and then $50 until the Association’s eighth bid of $18,500 was topped by Marsh’s of $18,550, forcing Dr. Griswold to concede that the Association had no further bids to make. Biglow then announced the sale of the property to Judge Marsh for $18,550, including the use of the house by Miss Florence for her lifetime. In the following year, the Marshes built their handsome house facing the river while Miss Florence continued to live in the Griswold house facing on Lyme Street, as she always had. The house was rent-free (though Judge Marsh retained the use of two rooms). On December 6, 1937, Florence Griswold died at the age of 86, at home, in her own bed, with Dr. Griswold, artist Gregory Smith, and her favorite cats at her side—and in familiar and well loved surroundings. 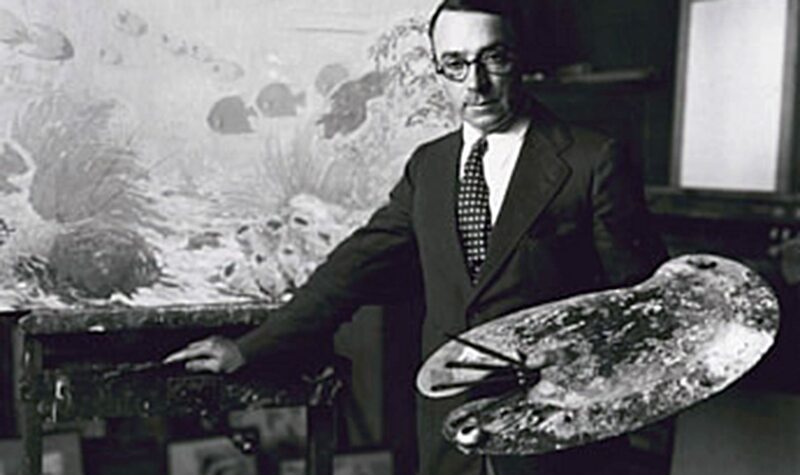 The Florence Griswold Association returned the money advanced on real estate by the various prospective buyers, but decided not to disband hoping that the house could eventually be acquired for use as a museum—the original plan suggested by the artists whose works would be displayed there and one that had been enthusiastically supported by everyone who had contributed to the amazing efforts of 1936. Sources: Research for this paper came from the archives of the Lyme Historical Society, Florence Griswold Museum: LHS Association Papers, 1936-1950, Box 1 and 2, and Florence Griswold Papers, Box 1 and 2. Additional biographical details came from digitized archives on the website of The New York Times. The September 9, 1936, article in the New York Herald Tribune is reproduced on microfilm at the New York Public Library.